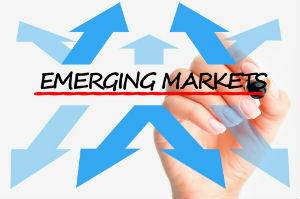 The emerging-nation gauge traded at 10.5 times projected 12-month earnings Wednesday, the highest in three months. (Bloomberg) — Emerging-market stocks retreated after the longest rally in 15 months spurred on valuations. Chinese rail shares surged on government plans to invest in new tracks, while faster-than-expected inflation in Turkey weighed on bonds. The S&P BSE Sensex Index fell from a record after stocks on the measure in Mumbai traded at their most-expensive level in five months. Yields on Turkey’s two-year notes jumped the most since March 10 and the lira lost 0.6 percent versus the dollar after the inflation rate rose to an eight-month high in March. Egypt’s EGX 30 Index slid the most in the world after a blast outside Cairo University Wednesday spurred security concerns. China Railway Group Ltd. rose 5.1 percent in Hong Kong. The MSCI Emerging Markets Index, which rallied 6.8 percent in the previous nine days, lost 0.4 percent to 1,001.45 at 1:45 p.m. in London. China outlined a package of measures including tax relief to support the economy and create jobs after a slowdown endangered Premier Li Keqiang’s target of 7.5 percent growth this year. The emerging-nation gauge traded at 10.5 times projected 12-month earnings yesterday, the highest in three months, according to data compiled by Bloomberg. The multiple for the MSCI World Index of developed-country equities was 14.9. A Bloomberg gauge tracking 20 emerging-market currencies decreased for a second day after reaching a three-month high on April 1. The premium investors demand to own developing-nation debt over U.S. Treasuries increased two basis points to 290, according to indexes compiled by JPMorgan Chase & Co. The Sensex retreated for the first time in seven days, losing 0.2 percent as State Bank of India fell 2 percent. The gauge advanced 2.3 percent in the previous six days as international investors extended Asia’s largest equity inflows. Poland’s WIG30 index fell for the first time in eight days. Russian stocks lost 0.5 percent, declining for a second day. The ruble lost 0.3 percent versus the dollar, while currencies in Brazil, South Africa and Turkey weakened at least 0.5 percent. Turkey’s two-year notes ended a seven-day advance, pushing the yield up 23 basis points to 10.75 percent. Annual inflation accelerated to 8.39 percent last month from 7.89 percent in February, topping the 8.1 percent median estimate of 12 analysts in a Bloomberg survey. Economists said the trend may continue as an unusually dry winter fuels food inflation. That may complicate any plans by the central bank to cut interest rates, which policy makers unexpectedly raised in January to halt a slide in the lira. Turkish stocks rallied 1.2 percent, taking the advance to 3.4 percent since Turkish Prime Minister Recep Tayyip Erdogan won in the March 30 local election. “We’ve seen decent rallies particularly in eastern Europe over the past few days, so today’s move might be a bit of a return to volatility,” William Jackson, an economist at Capital Economics Ltd. in London, said by phone. Investors in Turkey “have been buoyed by the election result there, which has provided some stability,” he said. Dubai’s DFM General Index gained 0.9 percent to the highest level since September 2008, while Pakistan’s stock gauge surged 1.2 percent to a record. The EGX 30 slumped 2.9 percent in Cairo. Bombings outside Cairo University killed a police officer and injured five Wednesday, marking an escalation in violence before presidential elections scheduled for May. All 10 industry groups in the emerging-markets measure declined, led by consumer-discretionary stocks and utility companies. Taiwan Semiconductor Manufacturing Co. dropped 1.3 percent in Taipei. The Shanghai Composite Index lost 0.7 percent as banks and developers fell after the China Securities Journal called for maintaining restrictions on home purchases. The Hang Seng China Enterprises Index of mainland companies listed in Hong Kong added 0.7 percent. China Railway Group surged the most since Sept. 3 after the government said it will sell 150 billion yuan ($24 billion) of bonds this year to build lines mainly in less-developed regions. China’s package of measures expand on the cabinet’s plans to speed up construction projects after slowdowns in manufacturing, retail sales and investment pointed to unexpectedly weak growth. –With assistance from Andras Gergely in Budapest and Ahmed A. Namatalla in Cairo.